Former Reuters journalist Matthew Keys, who was convicted last year of helping the Anonymous group of hackers, has been sentenced to 24 months in prison for computer hacking charges. Keys was found guilty last year in October of giving Anonymous login credentials that allowed the group to deface the Los Angeles Times, a Tribune Media-owned newspaper, back in 2013. After leaving the job at Tribune Company-owned Sacramento KTXL Fox 40 in 2010, Keys posted login credentials for the company's content management system (CMS) on a chatroom where hacking collective Anonymous planned out their operations. The hacking collective then logged into the CMS and defaced an LA Times article that remained defaced for about 40 minutes before a journalist noticed and changed it back – though Keys still denies all allegations. 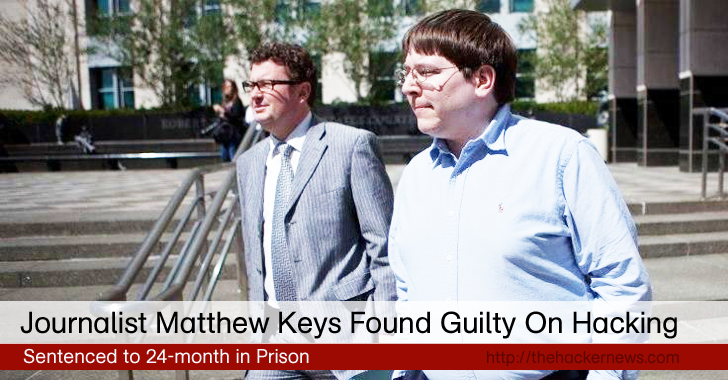 Keys faced a possible sentence of up to 25 years for three counts of hacking charges under the Computer Fraud and Abuse Act. Although the US Attorney General's office recommended a 5-year sentence, Keys has been condemned to two years in jail that will be followed by 2 years of supervised release. Keys is set to surrender on June 15, 2016. After sentencing, Keys went on Twitter and wrote: "When we do appeal, we're not only going to work to reverse the conviction, but try to change this absurd computer law, as best we can." In a blog post published on Medium, Keys also said that he was innocent and that the charges against him are "baseless, absurd and entirely wrong." He also said he is committed to journalism no matter what happens. "Whatever happens today, I hope I am able to continue serving the public with important stories of interest," Keys wrote. "Journalism is all I am good at, and I am not exactly sure what I will do if I am not able to do it anymore." The Keys' case has drawn wide scale attention of media as he served as a deputy social media editor at Reuters. After he had been charged with the hacking crime in March 2013, Keys was released by Reuters from his position.